Impressive, spacious 4 bedroom, 4 bathroom villa in the centre of sought after Foz do Arelho set in low maintenance gardens and private swimming pool and garage space for several cars and only 45 minutes to Lisbon. This beautiful property is in a quiet location just a short walk from all amenities and the beach. The accommodation includes a large basement which features a garage with space for several cars, laundry room, bathroom and office. Internal stairs up to the ground floor hallway with doors off to the fitted kitchen, shower room, double bedroom and a bright and spacious sitting room with dining area. This room includes a fire place and 2 sets of French doors to outside. Stairs from the hallway continue up to the first floor landing which has doors to three further double bedrooms. All have fitted wardrobes and one of which is en suite with a large private terrace. The family bathroom includes a full bath with shower over. Extras include central vacuum and pre installation for central heating. Outside there is an easy to maintain garden and a lovely sunny private swimming pool with paved surround. 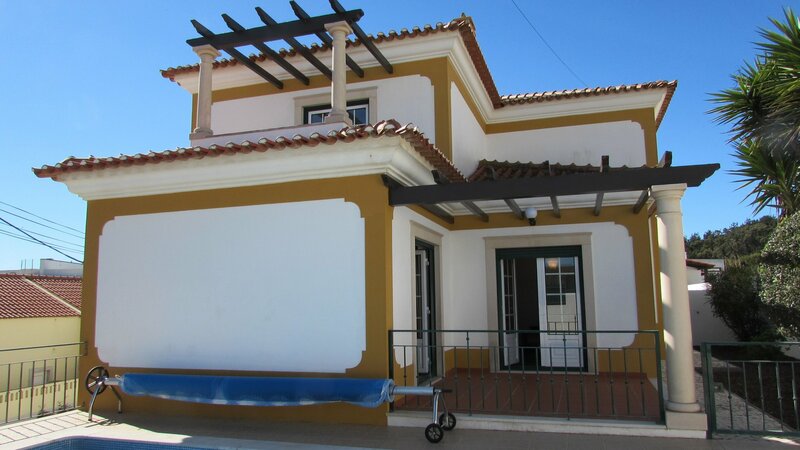 This lovely property is ideal as a permanent or holiday home and could also generate useful income from holiday rentals. Lisbon and the airport is within an hour's drive. The small village of Foz do Arelho, 8km west of Caldas da Rainha, sits 1km back from a beautiful, sheltered lagoon beach, which is overlooked by a couple of cafes. The road continues a further 500m or so to another tremendous beach where river meets ocean, and here there’s a promenade of bars and restaurants. It’s not really overdeveloped – this is more a holiday-home place than a resort – and outside July and August you’ll have the wide, white sands to yourself. On the lagoon itself, the Lagoa de Obidos, fishermen stand in the shallow waters next to their boats, attending to their nets.